Will Sindy collectors please note that the pictures below are just pictures of dolls from my own collection. Please do not use them for reference purposes as they are not all in completed outfits at the moment, but will be updated and added to as I find the correct items to complete each doll. The dolls shown also do not correspond with the year for the clothes they are wearing. All my Sindy Dolls her little sister Patch, Pedigree, Vintage and other Fashion Dolls will be added soon. 1960s Hong Kong Sindy in her original weekenders outfit consisting of a red white and blue striped top with over locked finish on the bottom and a white poppa fastener at the back neck. Teamed with blue denim jeans with a white poppa fastener, yellow stitching on the bottom and down the sides and also side pocket detail and replacement Sindy shoes. Sindy from 1970 / 80s Dressed in a 1960s weekenders outfit, this version of weekenders has a slightly longer jumper than the one pictured on the doll above with a blind stitched hem and white poppa fastener at the back neck. Blue denim Jeans with yellow stitching around the bottom and down the sides, white poppa fastener and side pocket detail and replacement Sindy shoes. 1970 / 80s Sindy dressed in Highland Fling #43014 from 1984 with replacement belt and boots, The original belt for this outfit has a round buckle. The boots should be black in what I call a cowboy style. 1970 / 80s Sindy wearing Wavy Navy #S215 from 1974 consisting of skirt, jacket hat and white shoes. This outfit should also have a blue handbag and white round tinted glasses. 1970 / 80s Mini Sindy dressed in what I think is a Goodmorning #44314 variant from 1978 consists of nightdress, negligee, and pink fluffy slippers. this outfit has a replacement tie belt. 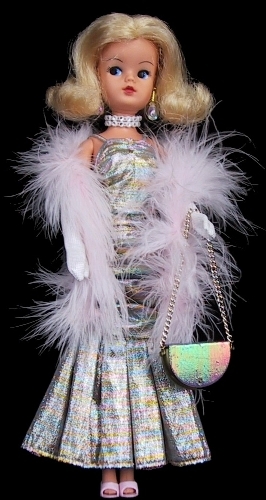 1970 / 80s Sindy dressed in Premiere #42016 from 1985 consisting of a shimmering gold, blue and pink lame dress, with matching shoulder bag, pink glittering open toe shoes, pink fur stole, diamante choker, earrings and elbow length gloves. 1970s Sindy dressed in Sindy casuals striped skirt and top #43005 from 1984 consisting of a skirt, top and belt. She is also wearing white sindy mules. 1970 / 80s mini Sindy in Leather look skirt #12S51 from 1963 teamed with a white sweater from 1963 and white Sindy boots.